Ziva R. Hassenfeld is a post doctoral fellow at the Jack, Joseph, and Morton Mandel Center for Studies in Jewish Education at Brandeis University. Ziva doctoral research focuses on the tools and reading strategies young children employ when reading Biblical texts as well as the pedagogies teachers use to support student textual interpretation. 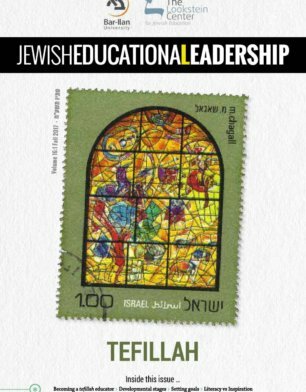 Ziva Hassenfeld argues that explorational text study can be a powerful tool for teaching tefillah. The students have been studying the story of Joseph. They are up to the moment where Joseph, disguised in his current leadership position in Egypt, begins to test his brothers who have come down from Canaan in search of food during the famine. “We saw in the pasuk yesterday, if we go back to the end of Miketz, Yehuda suggested that he would be, that all the brothers would be kept as slaves. And Yosef responded, ‘Halilah’, I wouldn’t do that. Only the person who took the goblet.” Mr. Fisher quotes Joseph’s words to Yehuda (Genesis 39:19). He continues, “Okay, today…” but before Mr. Fisher has a chance to begin the day’s lesson, a student in the third row looks up from her Humash and raises her hand. “Yes, Aviva?” Mr. Fisher calls out. Aviva looks at Mr. Fisher and then turns to the class. “Why does he say Halilah? It’s weird because the brothers also say Halilah.” Aviva, less than two minutes into class, still flushed from her square ball game at recess, has jumped head first into Torah study and invited her classmates to join her. She’s assumed the role of close reader and interpreter. She points out the Joseph wasn’t the first person in the scene to say “Halilah.” Rather, the word Halilah is used twice in the biblical text. Before Joseph, it is used by his brothers when they are speaking to him to express their horror at being accused of stealing the goblet (39:7). Mr. Fisher repeats Aviva’s observation to the class, “Yes, it’s interesting. The brothers say halilah and then Yosef says halilah back. So you want to know if he (Joseph) was using the same word they used on purpose?” All across the room hands shoot up. Some students have their elbow on their desk, others stand waving their arm above their head back and forth. Mr. Fisher begins calling on students. “No, he (Joseph) didn’t hear them use it,” one student insists. Jumping out of his seat, another student yells out, “It was just a term they used in those days.” “So why is it only twice? Why didn’t they say it a lot more if it was a term,” a third student challenges her classmate’s interpretation. Mr. Fisher takes a few more student comments and moves the class into the day’s lesson. He reads the first verse of the parashah out loud (in Hebrew): “Then Judah approached him and said, ‘Please, my lord, let now your servant speak something into my lord’s ears, and let not your wrath be kindled against your servant, for you are like Pharaoh. (Genesis 44:18).’” Once again, hands shoot up. Mr. Fisher calls on one shy student in the front. Hannah looks up from her Tanakh. “We said earlier that the Yosef used a translator to speak to his brothers, but now they are talking directly!” Hannah reminds the class of a verse they had studied earlier: “They did not know that Joseph understood, for the interpreter was between them.” (Genesis 42:23) “Oh wow,” Mr. Fisher responds, “We’ve been saying all along, when the brothers came to Yosef there was an interpreter speaking and now either we can assume Yosef started speaking lashon hakodesh, which is kind of strange, or, I guess, you have to say there is still an interpreter, which is also strange because it says he approached him and spoke in his ears.” The classroom erupts again. This textual “difficulty” is just as exciting as the last. The energy in this classroom is palpable as students eagerly raise their hands jockeying to offer their particular resolution to this textual question. Once again Mr. Fisher facilitates student debate over a student-posed, text-intensive question. It’s only minute eight of this unusual, yet inspiring classroom. As researcher-observer, this classroom was fascinating. In many ways, it confirmed what I have already found to be true: when given the space to do so, children, even young children, are capable and eager to engage in rich textual interpretation and discussion. They come to our sacred text with questions and ideas and enter our classrooms excited to share those questions and ideas. But what made this classroom observation particularly fascinating is that many of the students jumping out of their seats to offer answers to their classmates’ questions about the biblical text were the same kids who, hours earlier, were half-asleep and disengaged during morning tefillah. The contrast was not lost on me. 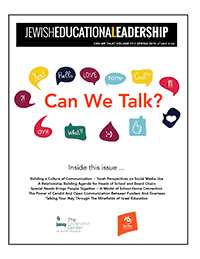 It has become increasingly popular to suggest that the solution to tefillah is to make it more experiential, more emotive, and less like school (Jacobson-Maisels, 2013; Sternberg, 2013). The idea is that during tefillah students should feel like they are out in the field dancing and singing or quietly meditating. Whatever the metaphor, the key to successful tefillah in school is engaging the heart. But this approach takes far too limited a view of what engages students. It is not necessarily the case that the move to the emotional is more engaging. Perhaps what students need in order to find prayer engaging is the same rigorous text study of the siddur that they do with other sacred texts like Tanakh and Mishnah. Imagine taking the same approach to Adon Olam as Mr. Fisher took to the Joseph story in Genesis. Imagine if we presented students with the text and allowed them to engage in the same close reading that was demonstrated above. I can almost hear the textual questions Mr. Fisher’s nine-year-old students would come up with. “’He was, He is’, what does that mean?” “‘He is One. There is no second,’ why would we think there is second?” “‘Then He was called King,’ who called God ‘King’?” “How can God ‘be mine’ if God is King?” Through sheer love of questions and textual exploration, spiritual meaning could easily emerge, not as the focus of the pedagogical activity, but as a necessary residual. I am not alone in making the argument for more text study of the siddur. Elie Kaunfer (2013) has proposed a similar approach to tefillah education. What I add here is a portrait of the possible. This small glimpse into Mr. Fisher’s fourth grade classroom is a reminder that students come into school with an innate eagerness to ask questions and make sense of texts. Sense making of texts (when “text” is understood broadly) has been their focal activity of early childhood. With the right pedagogy, teachers can encourage and engage students’ textual curiosity, fostering in them a love for the texts they engage. Educators’ greatest resource is students’ interpretive energy. This energy can be directed to texts of the siddur in the same way that it can for the texts of Tanakh. Kaunfer, E. (2013). Prayer in dialogue with Tanakh: A novel approach to Tefillah education. Hayidion, Spring 2013. Jacobson-Maisels, J. (2013). A vision of Tefilla education. Hayidion, Spring 2013. Sternberg, E. T. (2013). Cain’s prayer and Abel’s prayer: Struggling with school Tefillah. Hayidion, Spring 2013.